Recently I have been working on sites that don’t allow ssh access and I always find installing phpMyAdmin overkill and unnecessary for my needs. Therefore I wrote a single file script that you upload to your webserver, login to the database and immediately start writing queries. It allows you to write complex queries with joins or just simple inserts, updates or deletes and returns the result set quickly with the number of rows found or affected on a page that’s clear and easy to read. 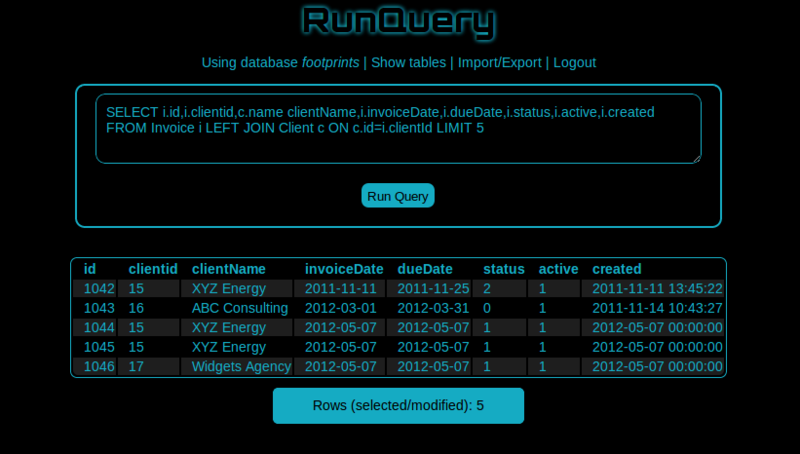 In the future I would like to add support for PostgreSQL and the ability to add or modify the data through a form. The code is available to download from github. Please try it and let me know what you think.